So we jumped in the car and headed to the Riverbend Music Center in Cincinnnati, Ohio for an evening with Jason Mraz. Having seats in the second row helped us overcome the tired feeling that crept up on us throughout the day, and we were on our way. The 2 hour drive from Indianapolis went quickly and the lack of traffic when we arrived was an extra treat as well. When we got to our seats we felt like we were just about sitting on Jason’s lap. Cool. I wasn’t really sure what to expect out of the show as I was admittedly not fond of the latest album release by Mraz and his band, however past experience had proved that Jason would provide a lively and entertaining show. That’s exactly what we got. The show consisted of a mix of new and older songs, all of which were played with an upbeat tempo. Jason Mraz refers to his band throughout the evening as “The Super Band” and that is pretty much true as the band consists of an additional guitarist, bass player, drummer, violinist, percussionist, a 3 horn section and a keyboardist of many talents. Mraz himself seems to perform with such ease that their is little doubt as to what he was meant to do with life. He seems to have a natural knack for telling the occasional humorous story and then performs his songs with the skill and accuracy you would expect on the big stage. 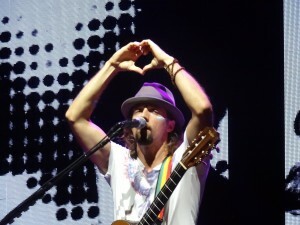 I’m going to give the show a thumbs up and recommend that you go see Jason Mraz in concert is he comes to your town!